During the branch battlefield tour of 2013 a short visit was made to Tyne Cot Cemetery, Belgium. 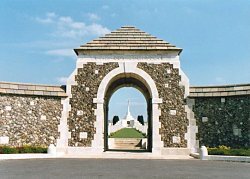 The cemetery which contains 11,956 burials of the First World War includes three recipients of the Victoria Cross - two Australians and one Canadian. The latter, Private James Peter Robertson was born at Albion Mines (now Stellarton), Pictou County, Nova Scotia on the 26th October, 1883, one of eleven children. His parents Alexander and Janet Robertson had emigrated from Scotland a few years earlier. When James was four years old the family moved to Springfield, where he began his education. The family moved again in 1899 to Medicine Hat, Alberta. On leaving school James became an employee of the Canadian Pacific Railway Company as a fireman and later on transfer to Lethbridge a locomotive engineer. On the 14th June, 1915 aged 31 he enlisted into the 13th Canadian Mounted Rifles at Macleod. He was described as being 6ft 1ins in height, with blue eyes, dark brown hair, a fair complexion, a chest measurement of 40-inches (41½-inches expanded), was unmarried and gave his religious denomination as Presbyterian. James nominated his mother, Janet as his next-of-kin, who was living at 656 51st Street, S.E., Medicine Hat and when he went overseas assigned to her an allotment $15 per month. He underwent basic training at Macleod and then moved to Medicine Hat where the 13th C.M.R., prepared for war service. James and his comrades received their inoculations and vaccinations but delays before going overseas caused much unrest within the 13th C.M.R. It was not until June 1916 that they left Canada on the S.S. Olympic and arrived in England on the 6th July, 1915. Stationed at Shorncliffe, Kent the 13th C.M.R had further intensive training before being sent to the Western Front. James was transferred to the 11th (Reserve) Battalion on the 17th September, 1916 and ten days later to the 27th Battalion joining them in France. The 27th Battalion, 28th Battalion and 31st Battalion formed the 6th Brigade in the 2nd Canadian Division. They had participated in the capture of Courcelette on the 15th September, 1916. All the assaulting battalions sustained heavy casualties both from shell and machine-gun fire but were able to consolidate their gains. On the 26th September, the Canadian Corps had been given the task of capturing positions to the east and north-east of Courcelette and were then to move forward in preparations for another attack to the north and north-east. At 1230 hours an artillery barrage crashed down on the enemy positions to which the Germans replied by shelling the Canadian front line and ruins of Courcelette. Intense fighting continued throughout the day during which the Canadians with grim determination occupied the enemy front line trenches. Private James Robertson joined the 27th Battalion the following day and had and abrupt introduction to trench warfare. During a German bombardment he and two other men were sheltering in a dug-out when a shell exploded near the entrance covering it with earth and debris. They remained entombed there for some hours until their comrades were able to release them. During November, James contracted influenza and was sent to No.1 Canadian Field Ambulance and then to No.6 on the 23rd November, 1916. Three days later he was transferred to No.22 Casualty Clearing Station and diagnosed there with an ulcerated tongue. On the 7th December he was moved to No.22 Convalescent Hospital at Camiers and four days later to No.39 General Hospital at Le Havre. James had been diagnosed with gonorrhoea at Medicine Hat in June 1916 and the ulcerated tongue was a symptom of venereal disease. Discharged from the hospital on the 6th February, 1917 he was sent to the Base Depot at Le Havre and re-joined 27th Battalion on the 24th. At the beginning of November 1917, the Canadian Corps were deployed in preparation for an attack north-eastward towards Passchendaele. Trench raids were undertaken on the night of the 1st-2nd and 3rd-4th November to occupy enemy positions, which helped to improve and consolidate the Canadian line. The main attack towards Passchendaele had begun at 0600 hours on the 6th November on a two divisional frontage. On the right the 2nd Canadian Division under the command of Major-General H.E. Burstall deployed the 27th, 28th and 31st Battalions, 6th Brigade commanded by Brigadier-General H.D.B. Ketchen, on a half-a-mile frontage. The objective of the 27th Battalion was the village of Passchendaele. Following the artillery barrage they met little opposition but as they got nearer to the village the leading troops came under intense enemy fire. The Canadians adopted a tactic of single file sections leap-frogging one another and captured positions around the village. On entering the main street the troops were subjected heavy machine-gun fire from an emplacement on their left. The position was located in the ruin of a building and surrounded by uncut barbed wire. The Germans fought off several attacks by the Canadians attempting to outflank the position by machine-gun and rifle fire from nearby houses. Private James Robertson had previously displayed a decisive ability in that he was able to quickly assess a situation in the attack. Having ensured that his comrades concentrated their machine-gun and rifle fire on the enemy position he dashed across the open ground, managed to outflank the enemy, jumped over the wire and bayonetted four German soldiers. The remainder of enemy machine-gun team fled away towards nearby houses. Several were shot down before reaching cover by Robertson using the enemy machine-gun. As the German strong-points were overcome the Canadians advanced through and around the village, shooting and bayoneting any Germans they encountered. Several pill-boxes and well-sited enemy emplacements were also engaged and overwhelmed. The fighting amongst the houses ceased at about 0745 hours when the 27th Battalion reported to HQ that the Germans had been driven out of the village. An hour later the Canadian objectives along a ridge on the eastern side behind the village had been captured. Throughout the day, despite enemy shell-fire the Canadians consolidated their gains and fought off disorganised German counter-attacks. 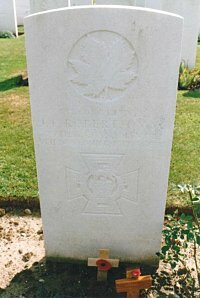 In the course of the fighting Robertson saw two of his battalion snipers lying wounded in front of the Canadian position. Without hesitation he went to their assistance and brought back one man into the safety of the Canadian line. Several Germans had seen his activity and began to harass Robertson's attempt to rescue the second wounded man. Under concentrated rifle fire he was hit and fell down. He got up, lifted the injured sniper on to his shoulder and returned with him towards the Canadian line, slipping and stumbling along as he did so. He laid the man down near to where his comrades could help him when suddenly a shell exploded close by and James Robertson was killed instantly. He was 35 years of age. During the evening the Germans bombarded the Canadians but did not follow it up with a counter-attack. For his conspicuous bravery Private James Robertson was posthumously awarded the Victoria Cross which was announced in the London Gazette of the 11th January, 1918: "James Peter Robertson, No.552665, Private, 27th Battalion, Canadian Infantry. For most conspicuous bravery and outstanding devotion to duty in attack. When his platoon was held up by uncut wire and a machine gun causing many casualties, Private Robertson dashed to an opening on the flank, rushed the machine-gun and after a desperate struggle with the crew, killed four and then turned the gun on the remainder, who, overcome by the fierceness of his onslaught, were running towards their own lines. His gallant work enabled the platoon to advance. He inflicted many more casualties among the enemy, and then, carrying the captured machine-gun, he led his platoon to the final position and got the gun into action, firing on the retreating enemy, who by this time were quite demoralized by the fire brought to bear on them." "During the consolidation, Private Robertson's most determined use of the machine-gun kept down the fire of the enemy's snipers. His courage and his coolness cheered his comrades and inspired them to the finest efforts. Later, when two of our snipers were badly wounded in front of our trench, he went out and carried one of them in under very severe fire. He was killed just as he returned with the second man." James Robertson was amiable and well-liked by his friends and comrades in the battalion. Back home in Canada where he worked on the railway he was nicknamed 'Singing Pete' as he could always be heard singing in the crew room or on the railway locomotive. He was offered promotion but declined preferring to remain a private and be one of the 'boys'. When he was killed both officers and men recorded that they had lost 'a good pal and friend'. 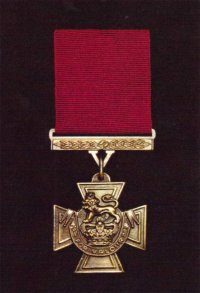 On the 25th April, 1918 the Lieutenant Governor, Robert Brett, presented Private James Robertson's Victoria Cross to his mother Janet at a ceremony held at Medicine Hat. Later a Memorial Park, a swimming pool, a street and the Royal Canadian Legion Branch were named in his memory at Medicine Hat. In 2011 the Canadian Coastguard Service named the first of their new 'Hero' class vessels, Private Robertson V.C. Private James Robertson V.C., lies buried in Tyne Cot Cemetery, Belgium. Grave Location: Section LVIII, Row D, Grave No.26. His name is also commemorated on page 317 in the First World War Book of Remembrance, held in the Memorial Chamber of the Peace Tower on Parliament Hill, Ottawa. Private James Peter Robertson's Victorian Cross and campaign medals are not publicly held. The two other recipients of the Victoria Cross buried in Tyne Cot Cemetery are Captain C.S. Jeffries, 34th Battalion, A.I.F., and Sergeant L. McGee, 40th Battalion, A.I.F. Lieutenant-Colonel P.E. 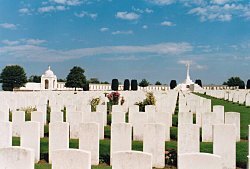 Bent V.C., D.S.O., The Leicestershire Regiment, Corporal W. Clamp V.C., The Yorkshire Regiment and Lance-Corporal E. Seaman V.C., The Royal Inniskilling Fusiliers have their names inscribed on the Memorial to the Missing in Tyne Cot Cemetery. Victoria Cross 1856-1920 - Sir O'Moore Creagh VC, GCB, GCSI, & E.M. Humphris. First edition published in 1920. Re-published in 1985 by J.B. Hayward & Son. VCs of the First World War ~ Passchendaele 1917 by Stephen Snelling. Sutton Publishing 1988. History of the Great War ~ Military Operations France & Belgium 1917 Volume II. Compiled by Brigadier-General Sir J.E. Edmonds CB, CMG. Published 1991 by The Imperial War Museum (UK) & The Battery Press (USA). Victoria Cross Locator by Dennis Pillinger & Anthony Staunton Published in 1997.